Add to the overall look of your costume with these good witch shoes. They are made out of clear plastic and have a butterfly accent sewn onto the toe. The 2" heel is made out of Lucite and the vinyl outer sole has non-slip grips. Faux leather covers the insole and gives it a metallic appearance. 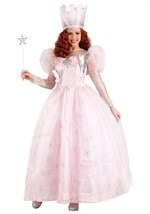 Add elegant detail to any of our Glinda the Good Witch costumes with our costume accessories.